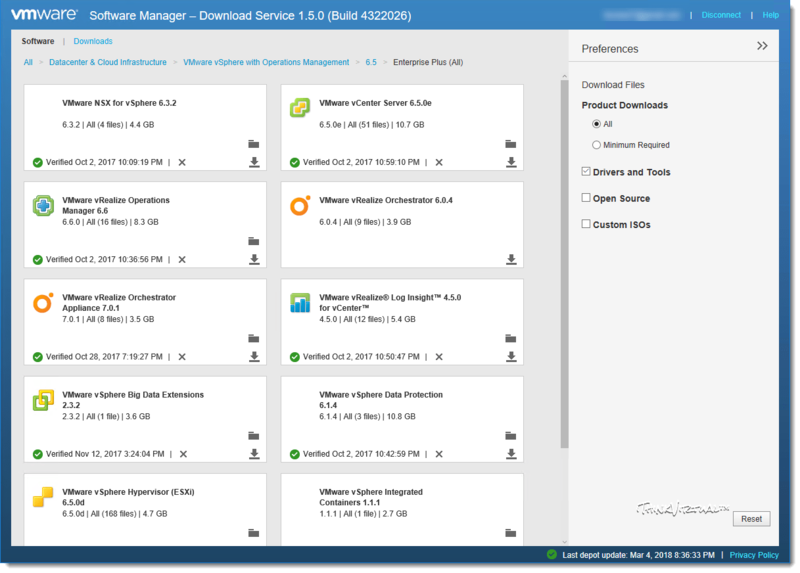 VMware Software Manager: The Good…The Bad…The Alternative! 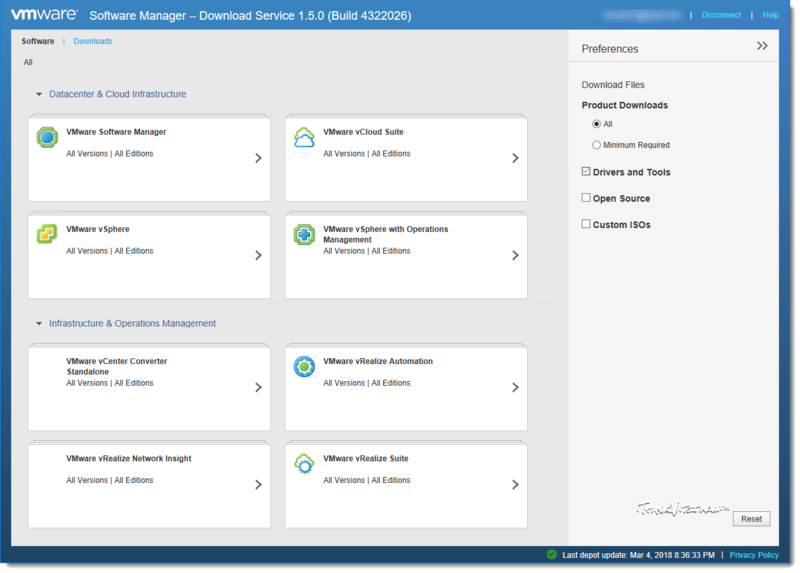 In this post, I am going to discuss a little, “not-so-well-known” utility, called VMware Software Manager. This little “beast” was first released as v1.0 back on 2015-03-12, and its most current release, v1.5, came out on 2016-08-25. So as you can see, it’s been quite a while since this tool has seen a new update release. The problem now is that this utility seems to have been forgotten and/or neglected by VMware, but I will get into more of that a little later. Let’s start off with the positive stuff. The VMware Software Manager allowed valid VMware-account holders the ability to download various software, such as ESXi or vCenter server, quickly and easily. The installation was a breeze, the interface was clean and downloading software was effortless. It basically just worked flawlessly! The new software was readily available for download shortly after it was announced/released since this utility would read configuration files to see what software is available from the VMware repository and then provided that software for download. My main gripe with this utility was that support was only community-based, so if you had issues, you could forget about raising an official SR with support. You had to rely patiently on the VMTN community and hope that users were knowledgeable enough and willing to help out. Not saying anything bad about the community though, it’s a great forum full of some really smart people and it provides a wealth of information. As I mentioned earlier, when this thing worked…it just plain WORKED! Then, vSphere 6.0U3A was released with some bad/corrupt or missing files and upon launching the utility, it would simply hang at login or error out due to the missing files not being available! (Shhhh!..someone never updated the configuration files… ¯\_(ツ)_/¯ ) There is a thread over on the VMTN community that myself and others have contributed to and another describing this issue and a workaround method to ultimately get you to log in again. This involved looking at log files to find which missing file was causing the error, then editing the configuration file to remove the missing files, and it was a major pain! Lastly, it’s become extremely out of date and it seems as if VMware has completed forgotten about and/or decided to neglect and give up on it as there has not been any new software available for download in at least 6 months. It’s also possible that the original responsible for this thing disbanded or moved onto other roles…who really knows? Luckily, a friend and fellow community/vExpert member has provided a solution! Fellow vExpert, Edward Haletky aka Texiwill, has created a Linux-based port of the utility, titled “VSM“, which he updates almost daily to add new software and simply improve the appliance and it runs on an RHEL type distro like CentOS. You can hit the ground running with this appliance in about 30 mins or less. I have been fortunate enough to serve as a beta tester for him and have been doing so since he released v0.95, just shortly after the initial public launch. At the time of this writing, the most recent release was v3.7.7 but has now been updated to the newest 4.5.3. Screenshots may reflect previous versions. Well…How do you get it? In this post, I am going to cover how to install this bad-boy on a CentOS 7 minimal installation on ESXi using NFS, and on VMware Workstation leveraging the “Shared Folders” feature using VMHGFS. Another vExpert, Michael White, has a similar post on setting up this appliance and using SMB/CIFS for storing the downloaded software. Let’s get to it, shall we! I will assume that you already have a basic installation of CentOS 7 running, or know how to set up a minimal installation, so that process is out of scope for this post. If you plan on running this on VMware Workstation/Fusion, run the following command to install the prerequisites needed for installing VMware Tools to get the vmhgfs driver for Shared Folders support. Otherwise, if you plan on using NFS to store the software, run the following command to install the NFS utilities. I will be installing the latest version of VMware Tools, version 10.2.0. This can be obtained here. Extract the .zip and attach the linux.iso to your CentOS VM in Workstation or Fusion. Once connected, do the following. Make a directory to mount the cdrom to. Mount the cdrom to this new directory. At this point, we are done with the .iso and can unmount it by running. Now, let’s navigate to the extracted folder and see what we’ve got. The Perl script is what we’re looking for here to install VMware Tools. This will uninstall “open-vm-tools” if that is already installed on this machine. Let’s go ahead and run it. Proceed to answer all the questions asked and select all of the defaults until the installation completes. 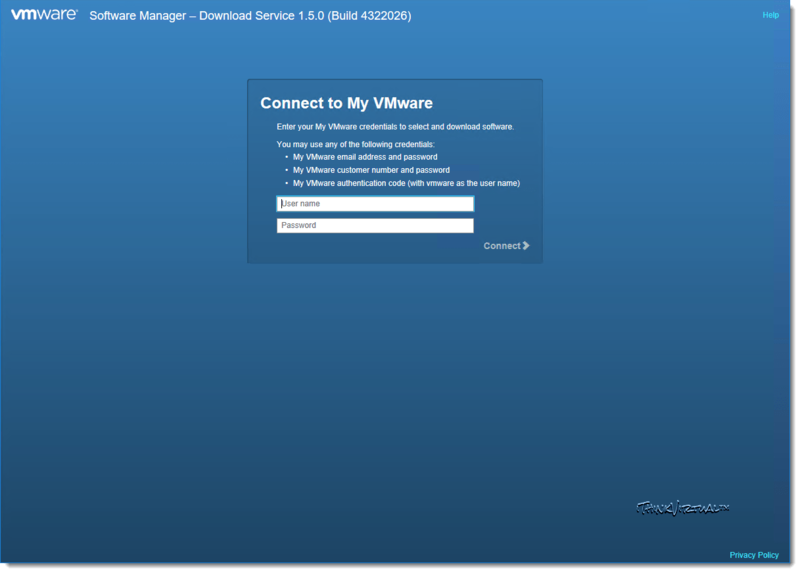 This completes the VMware Tools installation and not the vmhgfs driver is installed. Onto the good stuff! For those who prefer the manual approach, you’ll first need to install “wget“, then run the following commands to install the utility. Congrats! You’ve successfully installed the utility. Now to configure it for use. The last step before you can use the VSM script utility is to configure it. To list the all available parameters, execute the script with the help parameter. 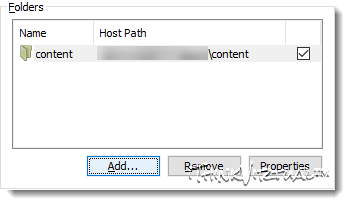 When first executing the script utility, you will be required to enter valid MyVMware credentials which will be saved to the configuration file. Let’s go ahead and create our repo directories first. Feel free to use my examples or anything else you’d like. We will also use the same steps mentioned about to take ownership of these directories and then mount our physical storage to the newly created mount point directory. Note: Be sure to enable “Shared Folders” on Workstation or Fusion and select the shared folder to mount it to the VM. Commands may be different from screenshots as I’ve updated some commands. With our directories ready, let’s go ahead and mount our storage to them! Note: I have mounted the following shared folder to the VM to use for this command. Now, with our storage mounted we can run the VSM script and configure for use. That about does it! The appliance is ready to use and you can navigate through the menus to find your desired software. To make your mount points persistent through reboots, edit the “fstab” file with your editor of choice. I prefer to use vi or vim, but many may choose to use nano instead. Then, add the following line and save the file. Updates are released quite frequently. To update VSM to the latest version, you can run the following commands manually or add them to a shell script within “/etc/cron.daily” which will run around 3 AM. Then add the following line to it and save. This will run daily at 6 AM. I tend to use the following command when running VSM to get missing suites and packages from MyVMware. If you do not use the “-m” parameter, it will only pull the same software available in the original VMware Software Manager tool from VMware. The “-mr” parameter resets the “MyVMware” software info and implies “-m” hence why this is also used in the crontab line above. The “-c” tells VSM to generate sha256sum checks against each downloaded file. Note: Depending on what you downloaded, there may be certain .txt files that will fail the checksum. This is expected and can be safely ignored. Well, I hope you’ve found this post useful and I thank you for reading! Special thanks again to Texiwill for making this awesome utility, as well as Mike White for posting his similar article using SMB/CIFS. Just a few days ago, PowerShell Core v6.0 was released for Windows, Linux, and macOS systems. Alongside this release came the release of VMware PowerCLI 10.0.0.78953 which is VMware’s own “PowerShell-like” utility. In my previous posts (here and here), I covered how to install those on to a macOS 10.13.x “High Sierra” system and a CentOS 7 system. In this post, I am going to show how to install both on to an Ubuntu 17.10 system as this is another common distro which I also use in my environments. Let’s get to it! Note: If you’re interested in installing this on other Linux distros, please consult the following link. There is a prerequisite needed before PowerShell can be installed on Ubuntu and that is to install “curl” and then add the PowerShell Core repository (recommended) to your system. To install curl, enter the following. To register the repository, enter the following command. Again, enter your password if prompted. Great! With the prerequisites complete, it’s time to install PowerShell Core 6.0.1. Run the following command to do so and enter your password when prompted. Awesome! Now, to launch a PowerShell session in CentOS, enter the following. 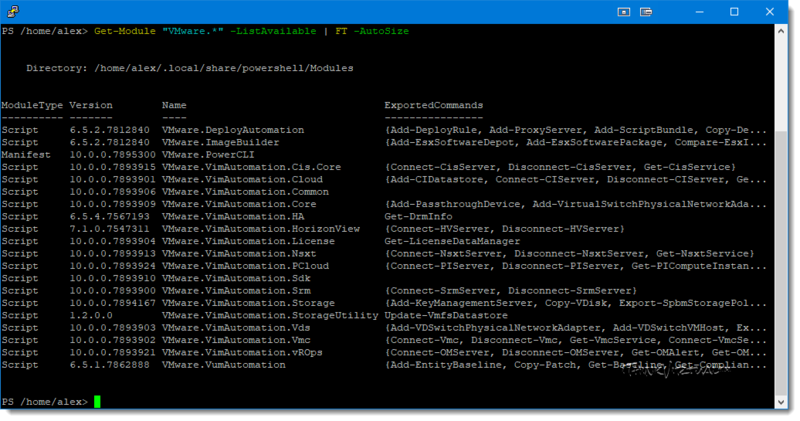 Within a PowerShell session, you can check the version of PowerShell by running the following. As new versions of PowerShell are released, simply update by running the following command. While leveraging the PowerShell Core repository is the recommended installation method, there are alternate methods as well. For more information on that along with uninstallation commands, please see the following link. Congratulations! You’ve successfully installed PowerShell Core 6.0.1 onto Ubuntu! Next comes the fun stuff for us VMware enthusiasts, installing VMware PowerCLI from the “PSGallery”. Let’s continue! Since VMware PowerCLI has moved from being its own native installer to the PSGallery, the PSGallery needs to be “Trusted” before anything from it can be installed. To trust the PSGallery, entering the following command in the PowerShell session. Set-PSRepository -Name "PSGallery" -InstallationPolicy "Trusted"
Note: Alternatively, you could set the “-Scope” parameter to “AllUsers” and if you wanted to install a different version you could use the “-RequiredVersion” parameter and specify the version number. Once this finishes, we can check to make sure the module is installed by running the following command. And if you’d like to see all of the VMware installed modules, run the following. As new versions of VMware.PowerCLI are released, you can run the following command to update it. With VMware.PowerCLI now installed, you can connect to your vCenter Server or ESXi host and begin using its cmdlets to obtain information or automate tasks! I went ahead and ran the following to ensure the module was imported. I noticed one caveat, the SRM module does not seem to be supported in PowerShell Core, so I hope that gets resolved soon. I also noticed an error when running the above command stating that the “InvalidCertificateAction” setting was “Unset” and not supported. To bypass this, enter the following command and then enter “Y” when prompted. This will set the parameter for the current user. Note: Alternatively, you can also use the “-Scope” parameter and enter “Session”, “User”, or “AllUsers” to apply the setting to those options respectively. Now, if we try to connect to vCenter again, we should be successful. Well, that about does it! I hope that you have found this post useful and I thank you for stopping by and reading my content. Until next time! In my previous post, I covered how to install those on to a macOS 10.13.x “High Sierra” system. In this post, I am going to show how to install both on to a CentOS 7 system as this is the distro I mostly use in my environments. I may follow this up with an Ubuntu install version. Anyway, let’s get to it! There is a prerequisite needed before PowerShell can be installed on CentOS and that is to add the PowerShell Core repository (recommended) to your CentOS system. This will prompt you to enter your password since “sudo“ is being used. Great! With the prerequisite complete, it’s time to install PowerShell Core 6.0.1. Run the following command to do so and enter your password when prompted. As new versions of PowerShell are released, simply update PowerShell by running the following command. Congratulations! You’ve successfully installed PowerShell Core 6.0.1 onto CentOS! Next comes the fun stuff for us VMware enthusiasts, installing VMware PowerCLI from the “PSGallery”. Let’s continue! Well, that about does it! I hope that you have found this post useful and I thank you for stopping by and reading my content. I’d like to give a shoutout to Jim Jones for his post on the same topic. Until next time! Just a few days ago, PowerShell Core v6.0 was released for Windows, Linux, and macOS systems. Alongside this release came the release of VMware PowerCLI 10.0.0.78953 which is VMware’s own “PowerShell-like” utility. In this post, I am going to show how to install both on to a macOS system. Let’s get to it! Homebrew-Cask – extends Homebrew and brings its elegance, simplicity, and speed to macOS applications and large binaries alike. Per the instructions on the Homebrew site, copy and paste the following command into a terminal window to install Homebrew. This will prompt you to press Enter to continue and the prompt you to enter your password. It will also check if Xcode command line tools are installed, and if not, it will download and install it for you before completing the installation of Homebrew. Nice! Now, the next step is to install Homebrew-Cask and per its sites installation notes, copy and paste the following command into a terminal window. Awesome! Now, to launch a PowerShell session in macOS, enter the following in terminal. 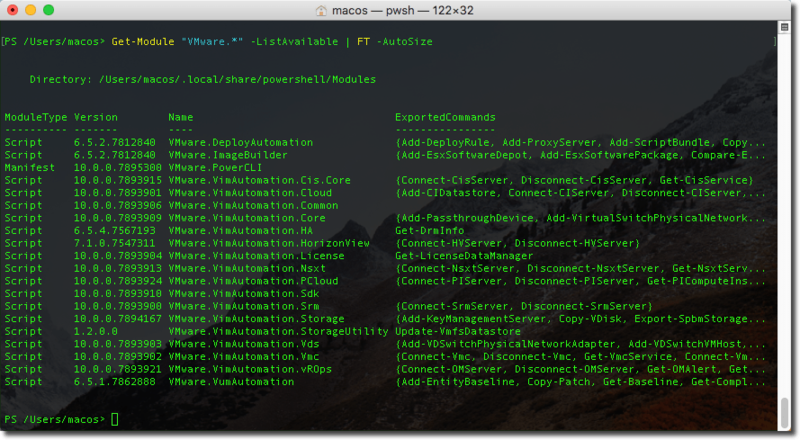 As new versions of PowerShell are released, simply update the Homebrew formulae and update PowerShell by running the following commands in terminal. While leveraging Homebrew is the recommended installation method, there are alternate methods as well. For more information on that along with uninstallation commands, please see the following link. Congratulations! You’ve successfully installed PowerShell Core 6.0.1 onto macOS! Next comes the fun stuff for us VMware enthusiasts, installing VMware PowerCLI from the “PSGallery”. Let’s continue! Well, that about does it! I hope that you have found this post useful and I thank you for stopping by and reading my content. I’d like to give a shoutout to Mike White for his post on the same topic. Until next time!